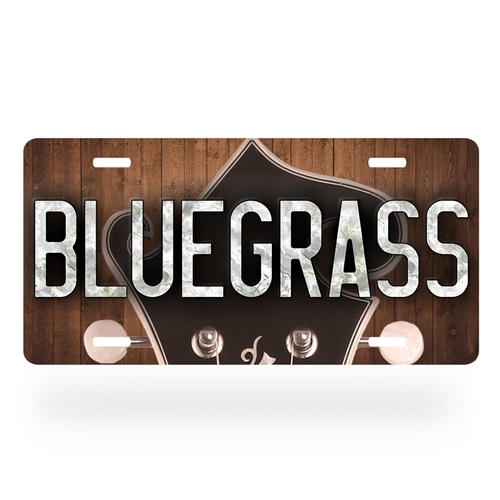 Only available through Bluescentric, the aluminum Bluegrass license plate features mother-of-pearl inlay in the word "Bluegrass" and a mandolin head. These plates look good on walls, cigar box guitars, music rooms, classic cars and daily drivers. The bluegrass license plate makes a great gift for folk and bluegrass lovers. These plates are printed using a full-color commercial sublimation process that will last for years. They are not "stamped" or indented. The Bluegrass License plate measures just shy of 12 inches by 6 inches (305x152.5mm). Plates are .25 inch thick durable non-rust aluminum and Made in America. They come premade with 1 inch (25.4mm) screw slots to attach to a car.